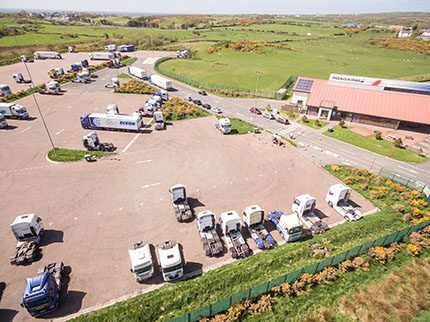 The port of Holyhead will have a brand-new 24-hour HGV refuelling facility thanks to Certas Energy which recently announced the development of a second facility, just off the A55 in North Wales at junction 2, with truck stop specialists RoadKing. Up to four HGVs will be able to refuel at the same time taking advantage of high speed pumps, which dispense fuel at up to 120 litres per minute. The site will also feature advanced data collection technology, fuel monitoring equipment, filtration systems and multi-product dispensers including road diesel, gas oil and AdBlue. UK Fuels, Key Fuels and Certas Energy fuel cards will all be accepted at the site, with Certas Energy customers receiving a 1ppl discount on all diesel purchases. Due to open this year, this new state-of-the-art bunker facility, will be created at the existing RoadKing truck stop. Having first opened its doors in May 2015, the facility offers drivers accommodation, a restaurant, a 24-hour fully licensed bar, as well as in demand wash facilities and showers. “We’re delighted to unveil our plans to build a brand-new HGV refuelling facility,” said Andrew Goodwin, national bunker manager. “Holyhead Port strengthens our commitment to fuelling Britain’s ports which includes the Port of Liverpool. “Around 400,000 lorries and trailers pass through the busy Holyhead Port every year making it one of the busiest ports in the UK for Irish Sea freight, so this is a strategic investment for us that supports our ambition to establish a strong network of refuelling locations across the UK. The partnership between Certas Energy and RoadKing follows on from the success of a similar development in 2017, which saw a new HGV refuelling bunker built at the New Hollies Truckstop in Cannock. Located on the A5, just off junction 12 of the M6, over 16,000 drivers have refuelled at the site since it launched 8 months ago. Nicholas Whatmore, Director for RoadKing said “We pride ourselves on speaking to drivers to make sure we give them everything they want in a truck stop and a refuelling facility is something that many of them have told us would be a huge benefit.